You know, when I first wrote the e-mail about Super Fantastico Saturday, I was just hoping to entice a lot of people to come out and play with us, since it would be a lot more fun that way. 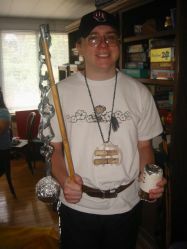 I didn’t know how popular Fantastico would be =) The theme for the party was that we were all on a Quest! 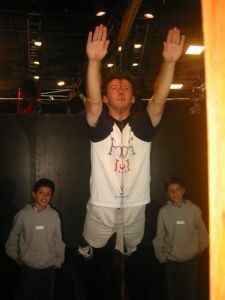 Eric and I came up with lots of adventures and missions for the teams to complete, like Escaping from the Dungeon (the three-legged race), or Steal the Golden Goose (tree climbing). We made up fun stories to go with everything. The day began with everyone making costumes and a coat of arms for their team! This was an absolute blast! Eric and I bought and collected tons of art supplies. We had everything from plain cardboard and poster board, to foam, feathers, felt, fake jewels, yarn, and even crazy leftover corks. It was so much fun to see how creative everyone can be! 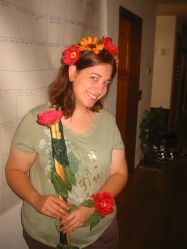 I was a druid dryad, so I made myself a cute headband from ribbon, silk flowers and leaves. Then I made a quarterstaff from bamboo I had leftover from Doris’s wedding. And I put more flowers on that. I loved it! I’m totally keeping it =) Eric finished the cloak that he’d started five or so years ago, and he made himself some elf ears and a nice bow. 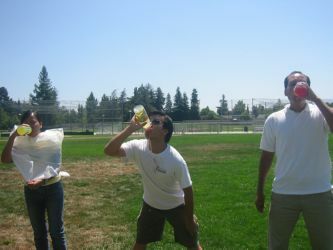 He finished most of that the night before, and busied himself with getting people signed up for the games. Some of my other favorite costume items included Patricia’s Boppit shield and jeweled dagger (inspired by Eric’s dragon dagger), Wes’s barbarian club made out of almost an entire roll of duct tape and corks, Juan’s lance, Austin’s faerie rambo look, Gavin’s awesome flail with duct tape chain links and a foil wrapped nerf ball (which I still have, and still enjoy swinging around), Robert’s awesome dwarf beard made from yarn, and Ken’s huge warhammer. Everything Jack made was amazing. 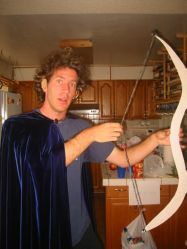 He made a lion bow, which is straight out of our dnd campaign. It looks so cool! 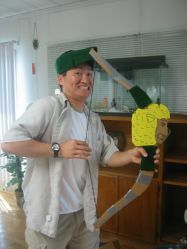 He also made a great hat =) Andrew made an enormous sword with a serrated edge. Everyone did such a good job with their costumes! 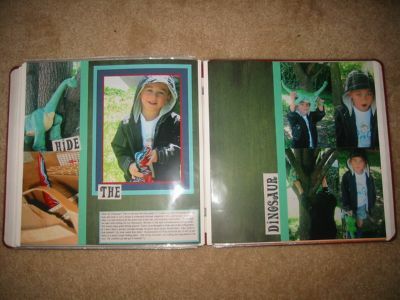 I can’t even list all the cool stuff that got made, I’ll just have to post the pictures so you can see for yourself. 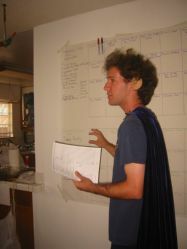 Eric was a half-elf archer! 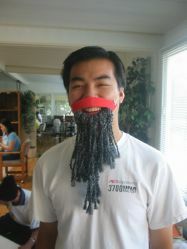 Robert made the beard because I harrassed him a bit =) Isn’t he a good sport! And isn’t it COOL! Gavin the orc cleric and his cool flail! Jack the hobbit archer and his lion bow! 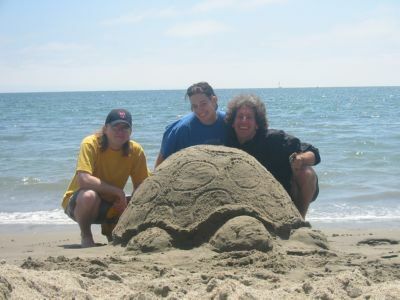 Jack’s the kind of artistic guy that can make anything look good! After finishing up the costumes, each team made a coat of arms to represent their party. My party was the Fantastico party =) Our shield turned out so cute that Eric wants me to redo the website to feature it =) It has a big F for fantastico surrounded by blue lightning bolts. Bobby, Jack and I worked on it =) The other team was called the Tarrdy party, since more than half of their team was still missing when the entire Fantastico team was there. It took slightly longer than planned with costumes, but we made it to the park in plenty of time to start all the quests! The first Quest we completed was Grapple the Rakshasa. The story behind that one was that you and your party are engaged in a mighty stuggle with an evil Rakshasa, when suddenly the world spins! You were just hit by a confusion spell! You must strike a final blow to defeat the Rakshasa. What you actually had to do was put your forehead on a bat, spin around eight to ten times, and then race to the finish line. This is not as easy as it seems. In fact, Tina Wu’s first words were, “what’s so hard about that?” Well, she managed to get third place, but for most people this was not easy at all! Angel and Patricia did their spinning and promptly fell right to the ground. Austin (or rather, Tinkerbell the Golden Wolf) spun super fast and took off running… sideways. I think he managed to stay up right, which was better than Eric’s first attempt at this game. He ran full out, and started tilting to the right until he lost his balance. He was going at a 45 degree angle for a while. Grapple the Rakshasa. Most of these people will be very dizzy in a moment. The next quests were Fire Breathing (a test to spit sunflower seeds), Topple the Giant (tug of war), and Throw the One Ring into Mount Doom. 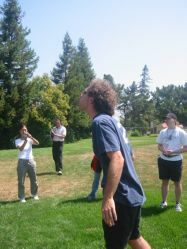 In Fire Breathing, Gavin managed to spit a sunflower seed at least 25 feet, maybe 30, much further than the rest of his competitors. Topple the Giant was your basic tug of war, made much more difficult by the fact that if the giant faced an Orc, he could only use one hand. Everyone was scared to face Andrew as the giant, but he decided he’d rather do arm wrestling, so Johnny had to be the giant for that team. Juan was the other giant. Of course, it’s nearly impossible to beat two people with only one hand, so both teams won the magic item for that quest. Oh, I forgot to mention! Every quest had a completion requirement, and if the teams successfully passed that they could both win the prize for that quest, all of which helped in the final quest, Slay the Dragon! 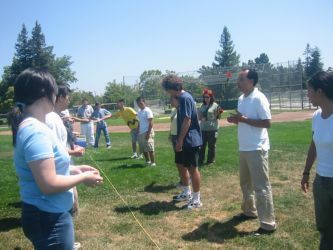 Throwing the One Ring into Mount Doom was a fun game =) Eric made a volcano out of rope that anyone that signed up for this game had to throw a frisbee into. John managed to hit the volcano (my quarterstaff) on the first try, although he’d said that was just a practice shot! No one else practiced after that =) Hobbits (Jack and Patricia) got to stand several feet closer to the volcano. Next up was Steal the Golden Goose. You might recognize the golden goose of fairy tale fame, Jack climbed the beanstalk to steal it from the giant. Eric hid the goose in a tree, and people competed to climb up and bring it down. I think the best time was about eleven seconds. It made me a bit nervous. Everyone did it very quickly, but Wes was amazing! Instead of climbing up in the tree, he swung up the branch like a monkey! I gave him bonus coolness points for that =) Eric and I randomly assigned bonus points when people did particularly great or character appropriate things. 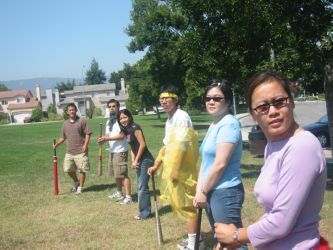 Water balloon =) Notice me waving my quarterstaff around. Gavin said I would be a good drum majorette with that thing. Dwarves and their drinking contest. See how neat Juan looks? No spilling! The last two quests in the park were Slay the Medusa and Brew a Potion of Flight. Slaying the Medusa was sort of a trust game. The medusa would turn you to stone, so to defeat her, two members of the party were blindfolded while a third directed them to pick up swords, and then directed them to the Medusa (Eric, no hair jokes please, =) Both teams did this quite well, although Andrew, who was supposed to be a statue, kept hitting his brother with his sword. Brewing a potion was a crazy game we took from APO bowl, where you hide a piece of gum in flour and then people have to search for it, not using hands of course, and then blow a bubble. This is not easy! But it is very funny =) Dr. Dave got covered in flour!!! After that, it was time for Pho. We ate lunch, and then went to the house to relax and do the afternoon quests. Amazingly, even though we got to the park late, we left for lunch right on time. The evening stuff took longer than we thought so we had to do prizes after Broomball. 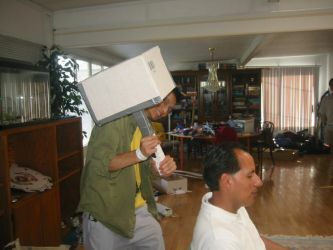 Ken and his hammer =) Which Eric later used in a game of Munchkin as a Hammer of Kneecapping. Sorcerer’s Sand: Guess how much sorcerer’s sand (m&m;’s) are in the jar. There were 1011 m&ms;, all of which I counted. The Hermit’s Challenge: Impress the hermit with your Intelligence. Complete a Sudoku puzzle quickly to win the prize. The game Dad gave us for Christmas came in hand for this one. Elves got to do an easy puzzle instead of a hard one, but Gavin still beat them, with robert half a second behind! That was amazing! I was proud I completed mine at all. It was so hard I needed some help from Robert! Wizard’s Duel: For this game, we played three rounds of Magic the Gathering. Each team just had to win one to get the prize, and they did. Barter at the Market: This was a game of Pizarro. It was so much fun! Normally, in Pizarro, it’s every person for themself, but in this game, we were on a team. Each team needed to get someone in either first or second place. It really changed the strategy, and was very interesting to figure out. I was on a team with Jack and Juan, who both also enjoy this kind of strategy, so we had a good time =) And, we won first AND second place! I didn’t win at all, I sacrificed for the good of the team. Duel to the Death: Epic Duels. Apparently this was a very exciting game of Epic Duels. It was the Vader and Boba against Luke and Chewy. Veronica evaded an All Too Easy. So it was a tough game =) Marilyn was Vader, and she was apparently down to one life against Han, and then got life back with her Dark Side Drains. She came back to win! Marilyn is really good at Epic Duels, she won the last tournament with Boba Fett! Hail of Arrows: This was crossfire. In case you don’t know, crossfire is a game played by shooting little steel balls across a board, and trying to knock either a triangle or a star into your opponent’s side. It can be really easy to stalemate if both people have the stamina to keep shooting. It’s a bit tiring. Evidently, Annie was being encouraged to just give up, but she persisted and finally won! Open the Magic Lock: This was another game that we didn’t have time for. It’s mastermind, and the goal was to guess the puzzle in five tries. I actually did this on Sunday too =) Eric made up the puzzle, and after my first three tries, I had basically no information. I knew there was either a red or a yellow, that there was one blue or one black, and two whites, two greens, or a white and a green. Basically nothing. And I guessed it! A bit of luck there! Melee: The melee was a game of Twister. I was amazed at the number of people who had never played Twister! They got quite the introduction to the game. Patricia got several butts in the face, and Austin wasn’t shy at all about going for his colors. =) There are some good pictures of this one I think. Battle Strategy: This was a math bowl type puzzle game. Marilyn, the math teacher, said it was very intense! All the players were very focused. Test of Strength: Arm wrestling, Wes versus Andrew. Very had game! They stood off for quite a while, but Andrew won eventually. Perform at the Inn: Taiko Drummaster! Perform for Fluffy: Guitar Hero! The story behind this one was that the only way to soothe Fluffy (from Harry Potter) was to play music. Gavin chose the song, “I want to be sedated.” He’s so funny! 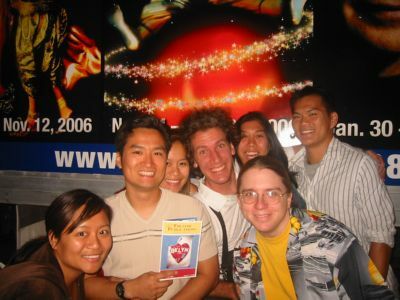 Test of Knowledge: This was my trivia game! It had six categories, Harry Potter, Fantasy Movies, Fantasy Books, Mythology, Fairy Tales, and Lord of the Rings. I had so much fun with this! I loved everyone trying to answer my questions. Some of them were quite hard, and I got a lot of fun out of the evil ones. For example, the hardest question on lord of the rings was in elvish! Yes, elvish! I stumped the contestant with that one, but Johnny was able to translate it. =) Also, a lot of my Harry Potter questions were things like, “If you were surrounded by dementors, what spell would you use to drive them off?” Jack came up with the bonus before the real answer on that one. He knew Harry’s spell made a stag, but it was a while before he said, the Patronus spell! Expecto Patronum! That was the hard one. I offered bonus questions on some of the hard ones for individual points. Gavin knew that Val Kilmer played Madmortigan in Willow =) It was fun! Curse of the Witch was charades, and Dance for the King was going to be a performance, but we had to cancel those two for lack of time. I almost forgot to write about the dragon! 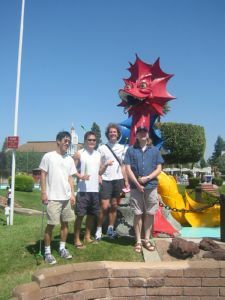 Slaying the Dragon was the final game. 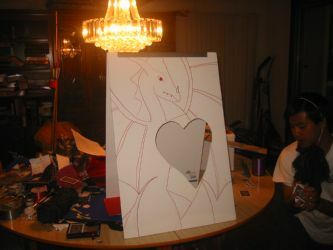 I drew a dragon on a piece of tagboard, and then cut a big hole for its heart. Archers could try and throw cards into the heart to do damage to the dragon. Warriors fighting with swords would play high card with the dragon to try and damage it. The dragon’s deck was stacked, as Boppit the Hobbit discovered. Patricia played a Hobbit paladin, and was awesome because she charged the dragon on her knees! So funny! Mages did damage to the dragon by correctly answering some of my trivia questions. Then all the magic items that the teams won throughout the day helped in the battle by giving them extra life, by damaging the dragon, or by distracting it. For example, the golden goose distracted the dragon from attacking for a turn. Eric and I (mostly Eric) made this game up ourselves, and that was a lot of fun for us in itself! It was also fun to see everyone getting to do their character stuff. Like John =) He was a cleric, and did a hilarious dance to heal people =) Austin’s charge as the faerie barbarian was also highly amusing =) Just picture a faerie named Tinkerbell the Golden Wolf charging a huge dragon. Austin is funny! We had so much fun with everything! I was so happy that everyone really got into the game, playing with costumes, wearing those costumes even in public! 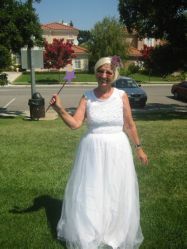 Ann came to the park in a beautiful fairy dress =) Everyone was just so wonderful! We are so lucky to have such amazing friends that can all get together and have a great time! The whole week was wonderful, especially the last day! Thanks to everyone who came, everyone who played, and everone who picked up! I hope you all enjoyed the prizes too =) We had lots of choices, from movies to games and books, and remember, if you wished you could pick a second prize, the extra prizes will be available at the next Epic Duels party! We love you! FridayFriday was a nice, laid back sort of day. Eric and I still had some things to finish up for Super Fantastico Saturday, printing riddles and setting up for games, so we took it slow. We went to badminton in the morning, which was so much fun! I hope we get to do it again with Juan and Veronica. I started off the day by hitting Austin in the head twice. Don’t worry, he got me back by hitting me three times. I also managed to hit Eddie. I was trying to pass him the birdie by picking it up with my racket, like everyone else does, and managed to flick it right in his face. Oops! I won’t be doing that again. Fortunately, no harm done. 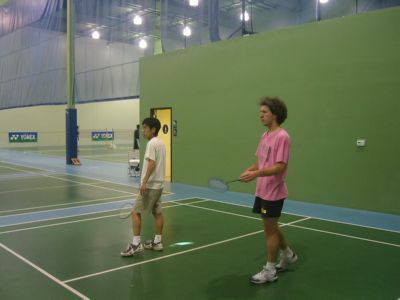 There were lots of great games of badminton =) It was fun to see Eric dive on the court again. After sushi, Juan was nice enough to drive the boys back for some Red Alert so I could go shopping with Marilyn. She tried on two wedding dresses, and found a bridesmaid’s dress that was just the right color. I was glad to get to see the color she wants in person, so now I have a better idea what to look for in decorating ideas. The rest of the day was all games and fun! We spent Thursday in San Francisco! All day, we left at 9:30 and didn’t get back till eleven. We went to the Exploratorium first, although because of a little trouble with signs one group crossed over the Golden Gate. The Exploratorium was full of fascinating information. I asked everybody what they learned, which threw them off a bit becaus they weren’t expecting homework. In the morning, I learned that dolphins blow bubble rings for fun. And that sand in different colors, with different angles fall at different rates. 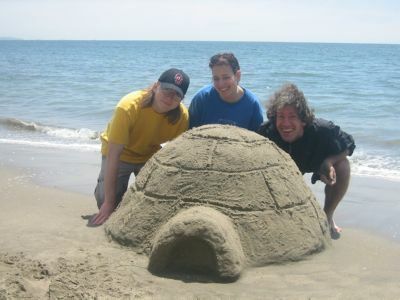 This means that if it’s in an hourglass, cool stripes will emerge as the sand falls. =) I played with that a lot. Gavin learned that IR (infrared) reflects in copper. They had this cool infrared camera set up where you could see where you were warm and cold. Austin’s hands were nearly black they were so cold. And you could touch cold metal, and give yourself little infrared tattoos. Behind you there were mirrors and copper pieces, and in the infrared only the copper reflected. Eric wanted to say that was what he learned too but G had already claimed it. So he learned that ice crystals make really pretty pattern when they were freezing =) When I first saw the exhibit that said you can watch ice freeze I thought it might be like watching grass grow, but it was really cool =) Austin learned that he had fast reflexes =) We all competed against each other and he was the fastest. Ann went straight to the biology exhibit. She learned that you can see a chicken’s heart beat five days after conception. Jack learned that heat is like light, and travels similarly. Oh, and there was also this cool water mirror. If you put your hand under the water and look at it in a mirror, it looks like your hand is in the air. And if you trap an air bubble in your hand, in the mirror it looks like a water bubble. G thought it looked like quicksilver. It was very neat! That was a lot to learn in the morning! So we went and ate a picnic near the Lagoon at the palace of fine arts, right outside. Marilyn and Patricia joined us. They had been looking at bridal shops. 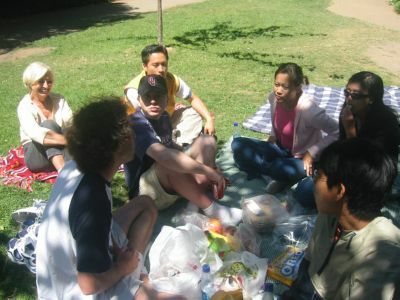 The picnic was delicious =) Then some of us decided we wanted to go back into the Exploratorium. Ann and Marilyn went to the de Young museum at Golden Gate park. It was funny, in the afternoon, everyone kept running up to me and saying, “I learned this…” so that they could claim it first. Eric learned about the Bernoulli effect, which was extremely cool but too complicated for me to explain without the little exhibit so he’ll have to tell you himself later. The strangest thing we did was play with the cheshire cat exhibit. You put a mirror up so one eye was looking at your friend, and the other eye watches your hand wave. It makes your friend’s face disappear! You just see their smile, or their eyes. It’s because motion is more important to see than something sitting still, safety-wise. It was very strange. Austin learned about torturing fish. Well, actually it was about how we watch motion in comparison with a fish. You know how you can stare at a ceiling fan, and your eye will track one blade, and then switch to another? Well, fishes eyes can’t move like ours. So to watch stripes moving around on their wall, they will swim in circles. Don’t worry, the fish get to rest in a much larger bowl and only have to swim in circles once in a while. After croquet, we went to a good dinner at the Beach Chalet. 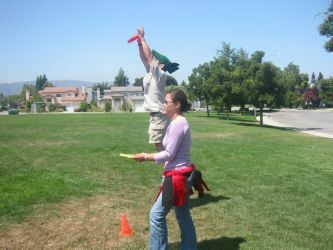 While we were waiting, I finally got to fly a kite! Eric and I went down to the beach for a bit! I used all the string! It flew beautifully. I’m going to get a kite for myself someday, it’s wonderful fun! Hello! Wednesday was another good day =) It was also Chrissie’s birthday, and so many lovely people called to tell her Happy Birthday =) It was great! We spent a lazy morning with Panera bagels and computer games and books. Ann brought over a rhubarb pie! Yummy! 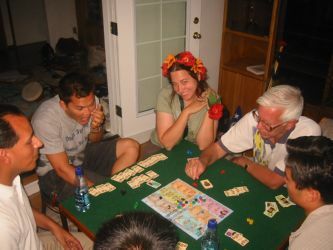 Eric and I worked a bit on Saturdays Super Fantastico games =) Then at night, we went out to Tomatina for dinner. It was yummy Italian food. We went to Dave and Busters after dinner. Dave and Busters is sort of a Chuckie Cheese for grownups. I go for the ski ball, which I was much better at when I was eight years old. Then I could consistently get 40’s and 50’s. Mostly 40’s. Now I’m all over the place =) It’s still fun though! Eddie played this crazy spinning game that sort of checks your reflexes. You hit the button when a light gets to a certain place in the circle. Juan came in and stole the jackpot though! I beat Eric and Gavin at basketball, although they both beat me at air hockey. I didn’t do too badly if you didn’t count the ones I scored on myself… Jack played a crazy game where you pretend to box, and you have to weave and everything. 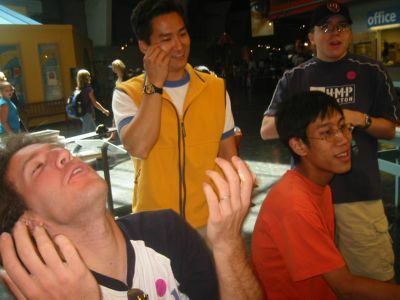 They have ways of connecting the games so you can play against each other, like a big game where you are all shooting guns off a ship at airplanes flying all around you, and a horse racing game. The only problem with D&Bs; is that everything there sounds like my cell phone. I got so many calls and with the beeping noises from the games my cell phone ring is stuck in my head. Chrissie playing with a Chinese finger trap she got for only ten tickets at Dave and Busters! This kept her entertained for a very long time! She was riding in the car with Veronica, and realized Eric was following them, and tried to wave, but realized she actually was trapped! Then we headed over to Tina Wu’s new condo! It is beautiful, and Juan and Veronica said it’s more decorated than their place that they’ve had for two years. Hi everyone! Another wonderful day! We spent the morning at the beach. It was beautiful. A little cloudy and cool in the morning, but the sun did come out. We played some frisbee, and some bocce ball (which is very interesting on the beach.) Ann brought her new inflatable boat, and she and Eric paddled around. She just wanted Eric in the boat for the increased power. He’s a good rower =) I think she enjoyed the boat even more on shore though. She used it like a bed! After we got back from the beach we cleaned up and headed out to dinner at Chevys for some good Mexican food. Ken came by and surprised us, which was great fun =) We still don’t know how he found us. After that, it was back to the house for games. John, Eric’s dad, really rocked out to Guitar Hero. Onpracha hadn’t heard that Andrew and Marilyn were engaged, so all the girls congregated around Chrissie’s computer looking at dresses and wedding stuff. The guys played red alert (6 people LAN game!) on all the other computers. It was pretty funny to see, all the people staring seriously at computers, and you look at the screens and on some things are blowing up, and on others are pretty dresses. Tina came by at 10pm and said it was Chrissie’s birthday by Oklahoma time so she got her presents! She got the Incredibles movie and a new tennis racket! Yay!!!! 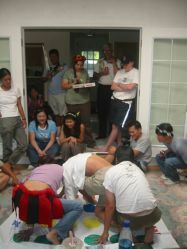 Then we played Claymania, where you try to get people to guess things by sculpting in clay. We also played Munchkin! Marilyn and I watched a movie, She’s the Man, which is based on Twelfth Night. It was really funny, we both laughed a lot. There were some moments that were really stupid, but just as many funny moments. =) Tina said it was a wonderful day, and was so glad we planned the party. That was so nice to hear =) I’m so glad we’re having it too, it’s been absolutely fabulous =) And on Saturday, it will be FANTASTICO! It’s day two and I’m still updating =) We had another great day! 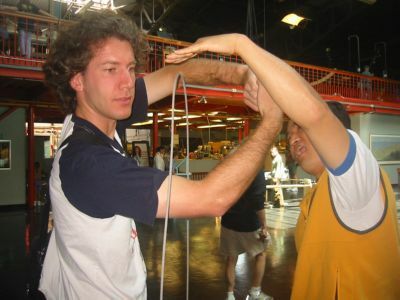 It started with badminton in the morning…. Eddie, Austin, Eric, Juan and Veronica had a blast! We’re doing it again on Friday and I hope I get to play too =) Evidently Eric was his usual exuberant self, diving across the floor to make shots. Eddie had a good game except for one moment that made all the guys wince. After that, Gavin and Chrissie met Austin, Eddie and Eric for Indian food! My favorite!!! It was extremely tasty. The funniest part, however, was watching Eddie go into convulsions after eating the spicy food. He says he wants to build his tolerance, but I’m not sure he’ll make it. Even the waiter was laughing at his pain. And the look on his face and his breathing made me think about calling Jessie, who is due to deliver her baby any day, possibly my birthday! Now we’re enjoying game night! I played some great Taiko Drummaster with Andrew. We were pretty well matched, although I am not nearly as good as I was a year ago, the last time I got to play =) I played a good game of Shadows over Camelot, where Eddie, Sir Galahad, turned out to be a traitor and betrayed us all to our deaths! No one really thought he was a traitor, because he played all kinds of things to help, and it seemed like when he did things wrong he was just making mistakes. I joked at one point that maybe he was the traitor because he kept wandering off and we had to call him for his turn, and it turned out he was! He was conferring with former traitors =) Too funny! We also played Settlers, Return of Heroes, Guitar Hero, and I think some Crossfire. Today was the first day of our Gathering. Eric and I spent the night at Eddie’s house, which he is letting us use for the week. Saturday Eric spent the whole day moving three carloads of stuff from our apartment to the house. So it is FULL of games, playstation, movies, art supplies, and all kinds of fun stuff. I helped a bit after work, and so now we’re all moved in. Gavin took a nap since his time is completely out of whack, and then we went out to dinner at E&O; trading company. It’s a southeast Asian grill in San Jose. It was delicious! As usual, I loved the corn fritters, and the spicy peppers they use as garnish =) We had a good turnout, with Andrew, Marilyn, Tina, Joyce, Jack, Patricia, Eddie, Gavin, Veronica, and Eric and Chrissie. Then we went to the play! We lost Andrew and Marilyn and gained John and Ann. We went to see Brooklyn the Musical. I loved it =) Which is unusual, since it’s not really a happily ever after sort of story. But the music was excellent, and I just love singing =) One of the songs especially gave me chills, when Brooklyn (one of the main characters) is singing about fairy tales at her concert. But the characters were interesting and complicated, and the story line, while not exactly happy, was still at times funny, poignant, and hopeful. I still believe in happy endings too =) Yay! After the musical we walked by the Rube Goldberg machine at the Tech Museum. I love that thing =) Pool balls fly through the air in the complicated machinery. It’s mesmerizing to watch. Eddie, in a burst of exuberance, tried to swing around a pole and landed on his bottom. We decided he needed to go back to stripper class. 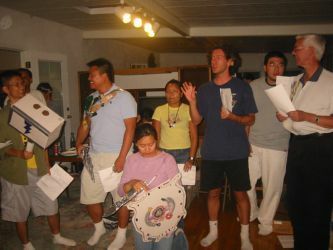 Now we’re back at the house, playing Guitar Hero. Gavin looks like a good guitarist, and so does Eddie with his new hair color =) We’re having lots of fun! Come over! Tomorrow is badminton, lunch at the Indian Restaurant, mini-golf, and then game night! So call us if you want to join in at the last minute for any of this great stuff! Love ya! Posted in Uncategorized | Comments Off on Gathering News!